Where do I use my REN Clean Skincare voucher code? Browse around at REN Skincare to find natural skincare products for the face and body. These products include cleansers, BB cream, exfoliators, eye products, grooming products, lip products, moisturisers, masks, night care creams, primers, toners, serums, bath oils, body creams, body oils, body washes, hair care, hand care, scrubs and balms. You can shop by skin type to find products suitable for your individual complexions such as anti-ageing skincare, blemish-prone skin, combination skin, dry skin, sensitive skin and essentials. You can also check out what’s trending now to find vegan skincare, AHAs, vitamin c products, lactic acid, hyaluronic acid, glycolic acid as well as bestsellers, award winners and new in products. As well as all this you can also shop by range to discover the Evercalm collection, the Bio Retinoid collection, Clarimatte, ClearCalm 3, Flash, Keep Young and Beautiful, Perfect Canvas, Radiance, Rosa Centifolia, V-Cense, Vita Mineral, Atlantic Kelp & Magnesium and the Moroccan Rose collection. You can also discover perfect skincare gifts for both men and women as well as an offers section and a blog. REN Skincare only uses 100% recyclable packaging, refillable solutions and bottles with reclaimed ocean plastic. All this is part of their plan to work towards a waste-free future, and you can be a part of it. To tackle the current waste issue REN Skincare have taken action by joining with a global activist partner, Surfrider. And not only are they using recycled packaging they’re also cleaning up beaches and oceans worldwide to tackle the problem with plastic in the ocean. Every time you purchase goods from REN Skincare you’re helping to contribute to the waste solution, so not only can you feel good about affordable, chemical-free skincare, you can also rest easy knowing you’re helping to save the planet. If you’re looking for help and advice about skin care you can find tons of guidance in the form of blog posts and articles in the blog. Find information in the section about AHA tonic, reducing waste, Retinol, sensitive skin, the ocean plastic bottle and much more. 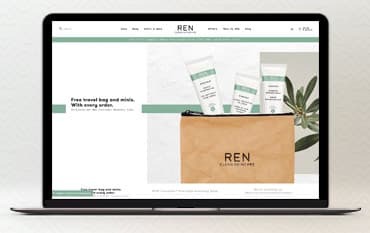 New blog posts are added to this section regularly so you can check back whenever you want to find new information and advice about REN Skincare’s range. You can also browse through older posts, or use the search bar to find relevant posts and information on the topics you’d like to know about. While you're asleep, your skin is hard at work, cleaning, renewing and regenerating. Give it a helping hand with REN Skincare’s collection of night care developed to help you wake up looking great. In this collection, you can find a range of night creams and facial tonics designed to make you glow. Then there’s also anti-ageing night treatments, bio-retinol oils and eye serums as well as pillow spray that’ll give you the most tranquil night ever. Browse through the night care section to find products suitable for you, all the items in the collection are extremely affordable and are made with no harmful chemicals or ingredients. REN Skincare want you (and your skin) to be happy, so, if you’re not totally satisfied - they can offer a refund or exchange. Goods must be returned within 30 days of purchase date, securely packaged. REN Skincare is a natural skincare company that provide beauty solutions for the face and body. REN Skincare chooses only bio-actives that benefit skin health and ingredients that protect the efficacy of the formula while making it a pleasure to use. With no toxins, no harsh or controversial chemicals, and no potential irritants, you can rest assured that your skincare products are 100% natural and good for the skin. Shop online with a REN Skincare discount code to save money on your order. So whether you’re looking to buy cleaners, moisturiser, creams, oils or balms, you can find it all for less at REN Skincare.